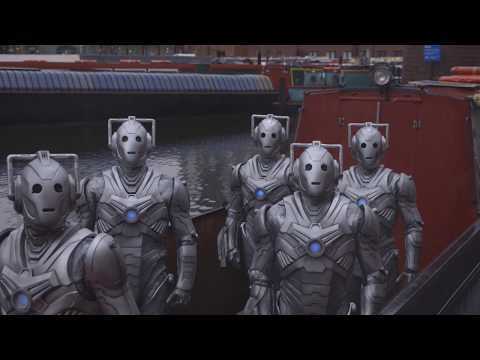 To the surprise of many shoppers, Cybermen were spotted in two major cities in the UK today, to mark tickets going on sale for Worlds Collide, the first official Doctor Who live escape game. One of the Time Lord’s oldest enemies, which feature in the new game, commandeered a barge on the canal at Gas Street Basin in Birmingham. Next, they were seen threatening to ‘upgrade’ unsuspecting Christmas shoppers outside the iconic Birmingham Bullring shopping centre, before travelling up through the UK, heading straight for Leeds City Centre, frightening local commuters in the process. Fans have been eagerly awaiting details of the BBC Studios and Escape Hunt Doctor Who-themed live escape game, which will be playable at Escape Hunt venues across the country from early 2019. Teams of up to six become the Doctor’s new friends and are transported into the future, to the offices of ChronosCorp HQ, where eccentric billionaire Alastair Montague’s efforts to develop commercial time travel have caused a tear in the fabric of space and time, a tear which the Cyberman will use to attack Earth! We are thrilled that tickets are now on sale and fans can start booking to be the first to play the game in January. We are extremely proud of Worlds Collide and look forward to giving fans a unique Doctor Who escape game experience. We’re very excited to be revealing details of the very first official Doctor Who escape game in collaboration with Escape Hunt. We used to hide behind the sofa when the Cybermen appeared on TV, it’s amazing that fans will soon be able to encounter them face to face.